This 7 page tutorial will take you step-by-step through the process of making one of these beautiful beaded charm beads using 21 clear colour photographs detailing the instructions. The finished beads are 21mm in diameter and 10mm in thickness, with a 5mm diameter central hole. 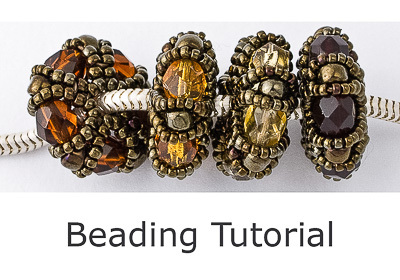 This tutorial is suitable for beginners and experienced beaders alike and should take approximately 30 minutes to make each bead. When you purchase this tutorial, it will be emailed to you in PDF format. You are free to use the beads you make from this tutorial as you wish.